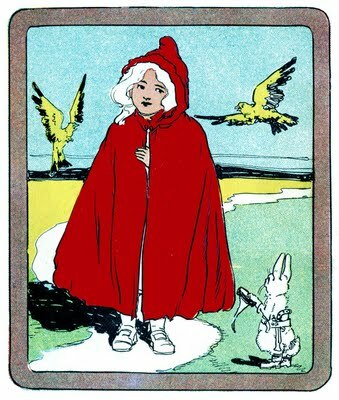 This wonderful classic Red Riding Hood graphic comes from a 1908 Children’s book! This is another one from the collection of my dear friend Ted, who passed away recently. At one time he lived in a huge Victorian house and one room was dedicated entirely to Little Red! He had quite a collection of things. I purchased this one from him some time ago, and just found it today on one of my shelves. I know he would want everyone to enjoy it. Vintage Smiling Child in Wide Brim Hat Image! Vintage Clip Art – Children’s Bookplate – Squirrel – Elf Children Playing London Bridge Image – Darling! The bunny is never armed in any of my books! Great image. Thank you, thank you! I love all things LRRH and this is great. Is that bunny packing heat!!? ?